Home Farm PowerShell SharePoint SharePoint 2010 SharePoint 2013 SharePoint 2016 How to Get SharePoint Farm ID using PowerShell? Get SharePoint Farm ID to apply a third party product license to our SharePoint 2016 environment. How to Get SharePoint Farm ID? SharePoint farm id is a GUID which is uniquely identifies each farm. To get the Farm Id in SharePoint, use this handy PowerShell code. 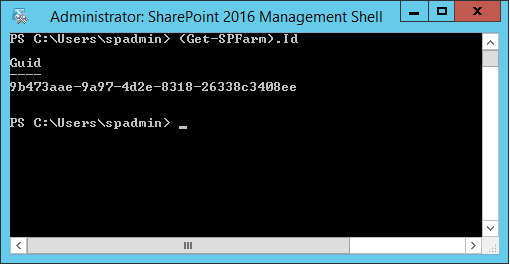 Just open SharePoint 2016 Management Shell and paste this cmdlet in it to find the farm id of the SharePoint Farm. This gets your the SharePoint farm id. You'll get a GUID similar to above screenshot. Although you can query SharePoint Farm config database to get this information, its strongly recommended to use PowerShell, instead of accessing SharePoint database. My SharePoint Farm is down! Can I get it from anywhere else?